*When using the system of fiberstrong Shampoo and Conditioner treatment, and Intra-Cylane™ Fortifying Cream vs. a non-conditioning shampoo. WHAT BIOLAGE PRODUCTS ARE RIGHT FOR YOU? FIND OUT NOW! 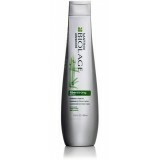 Biolage Advanced Fiberstrong Conditioner 400mL Fragile hair leads to break..
Biolage Advanced Fiberstrong Shampoo 400mL Fragile hair may be prone to br..